Are you worried that your senior years has taken a toll on your dating life? Well, worry no more because, in this Senior Friend Finder review, we will be talking about everything that you need to know about this online dating site. Being in your senior years doesn’t mean that your life is pretty much over. The truth is, this is actually when your life will begin. The reason behind this is because it is where you can start enjoying your life. And if you are single or someone who has gone out of a long-term relationship, then it would be nice to join an online dating site that is catered to seniors like you. One of the best senior dating sites is Senior Friend Finder. Get to know more about this online dating site by reading the information below. 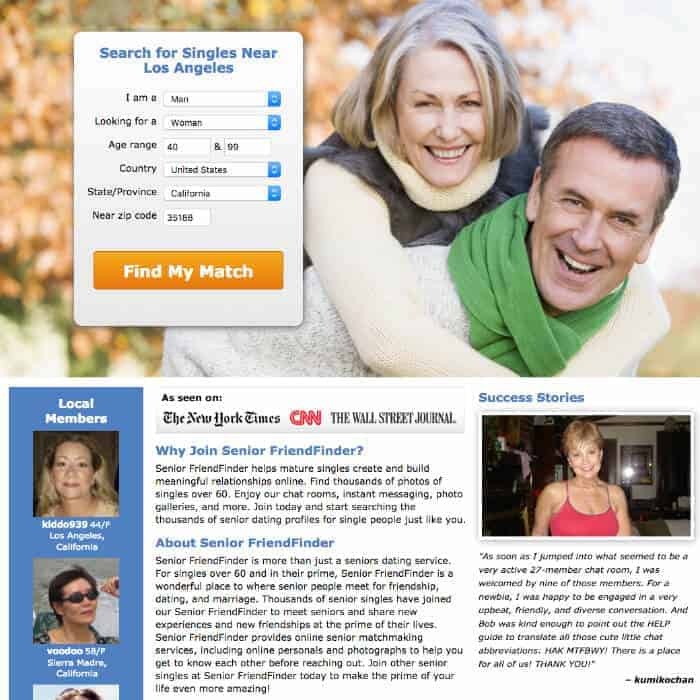 A dating site that is specializing in helping senior citizen to find new friends and even a potential romantic match is Senior Friend Finder. There are thousands of senior members here who are into exchanging emails, chatting, and even meeting up in person daily. With all of the advanced search tools and as well as profiles that are information, finding a friend or someone special is definitely possible. Senior Friend Finder has a very responsive customer service department. They also make sure that every profile in their website is verified to provide peace of mind for everyone. Another good thing about Senior Friend Finder is that the photographs in the site are also checked. They also have a fraud detection system to ensure that every member on Senior Friend Finder will be safe. Senior Friend Finder has a simple design, which is ideal for the members of the site because they don’t need any flashy design. The website has a menu system which will be similar to the ones that you can see on another online dating site. So if you are a senior and you are dreading that complicated tech stuff, then you shouldn’t worry about anything here on Senior Friend Finder. Signing up on Senior Friend Finder’s signing up process is easy. All you have to do is to customize a few things if needed. For instance, if there are elderly couples who have signed up, and are looking for just friendship. Then they need to be clear about that, so other members know that they are looking for just friendship. Signing up will just be like with other online dating sites. This will include entering your valid email address and your username and password for you to be able to get started. Now once you are done signing up, the next thing that you need to do is to set up your profile. You don’t have to worry about anything because the process will not take long. Majority of the questions there are optional, which means that you can just fill it out later. I think it is worth mentioning that members have the ability to let others know how their lifestyles are active. This is a great feature that not ever dating site has. On the left side of the page, you can quickly check your primary stats, such as your number of forum posts, profile views, and of course the number of flirts and messages. You can see the search results, which will be displayed in your screen’s middle section. One of the best things about this is that the site made sure that you will be able to see the gender and the age of the members. Now, when it comes to the right side, it is where you can see the website’s extended community, which will feature group events, testimonials, and as well as the latest blog posts. The matching system is secure with tons of filters that you can use. This will help you customize the result if needed, so you can find a member that will suit your preferences. One of the things that most people don’t know is that Senior Friend Finder is also into non-straight relationships. So if you are a lesbian or gay senior, then you can surely be able to find a match here. As mentioned above, Senior Friend Finder is an online dating site that caters to both friendship and romance. Members can have their own blogs and even share their own thoughts with other members. They can also comment on the posts of their friends. Members can communicate by sending messaging or exchanging emails. They can move on with chatting using an instant messaging feature. Another good thing about Senior Friend Finder is that there is a chat room where members can share their interests and thoughts. The only issue with this thing is that the communicated are under a premium membership. Another good thing about Senior Friend Finder is that there is an app for members who are comfortable using a tablet or a smartphone. The app is mobile friendly because of the browser version that it has. It is entirely made for smaller screens with navigation that is touched based. All of the features can also be accessed through the AllFriendFinder app, which you can download for your iOS devices. You can send and check messages through your app. Of course, you can also find local members and upload photos using the app. These are all of the information that is vital for you once you decide to sign up. In this Senior Friend Finder review, you surely now know what to expect once you hit that sign up button.